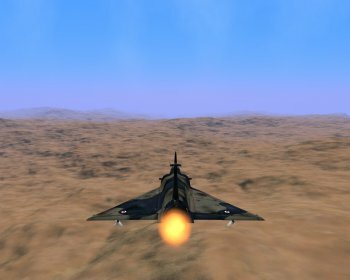 FighterPilot is a combat flight simulator in which players fly a fourth generation jet aircraft on a series of missions to eliminate enemy targets. As the pilot of a Dassault Mirage 2000, players face a range of enemies from hostile aircraft to ground based defenses. And thanks to arcade style controls, you can be flying in minutes. The single player mode takes you through a seven level campaign, challenging you with the task of eliminating a series of increasingly difficult adversaries. In multiplayer mode, a split screen view allows two players to play together on a single computer. Players can either compete against each other, or they can work cooperatively to complete levels of the campaign. Finally, a built in level editor lets you create your own custom levels.